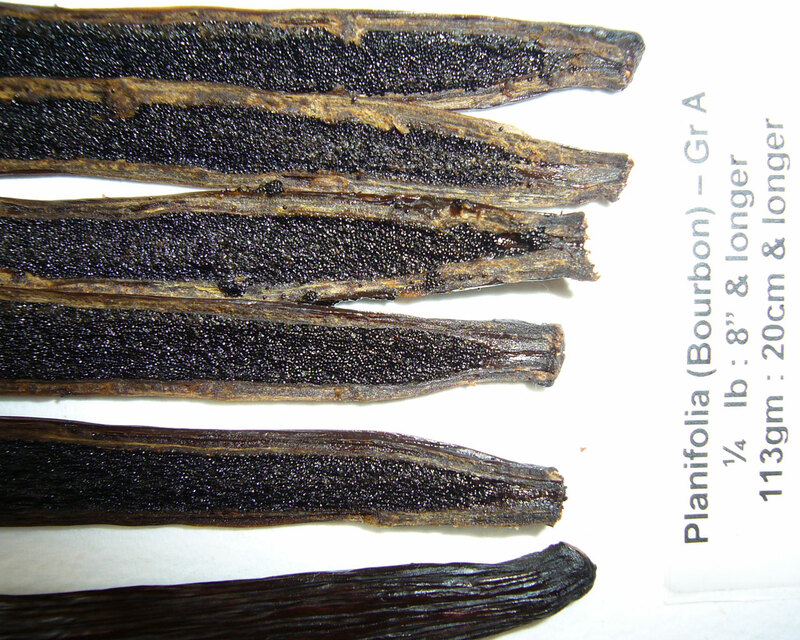 Vanilla beans reviewed: Grade A and B PNG Planifolia. 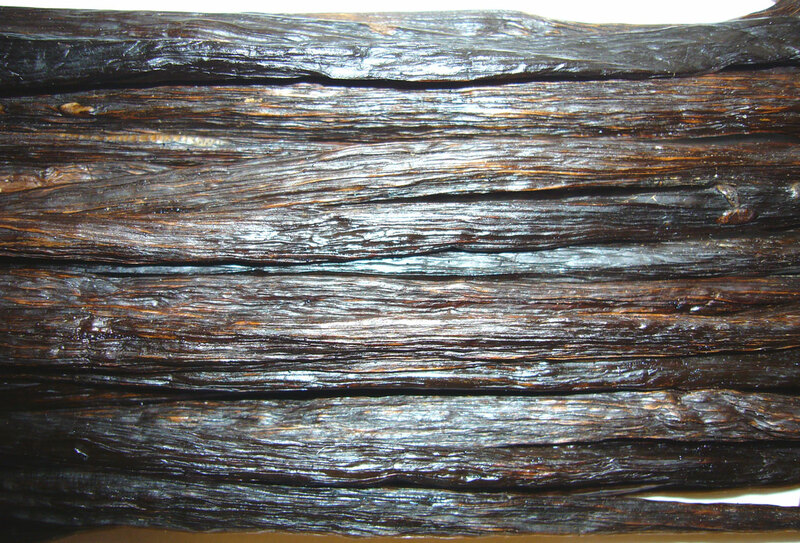 Grade A PNG Tahitensis. 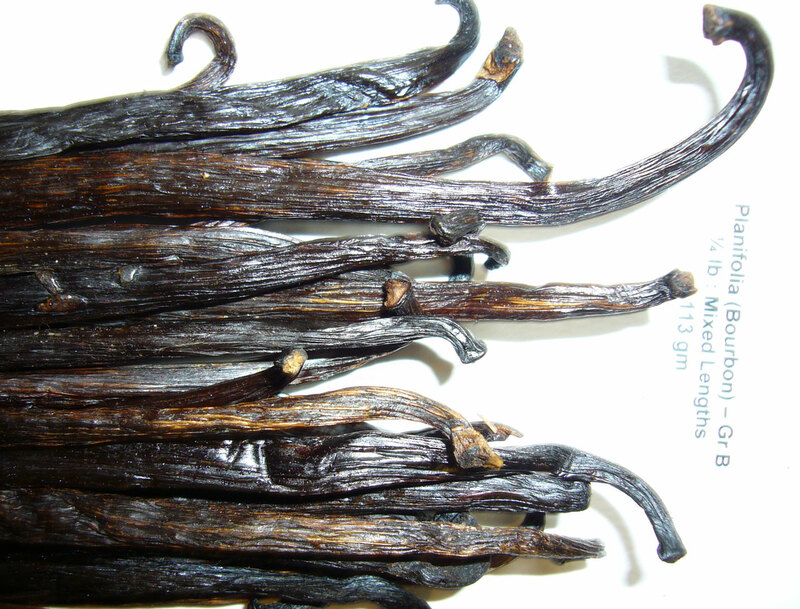 Cost: The Organic Vanilla Bean Company provided these beans for review. 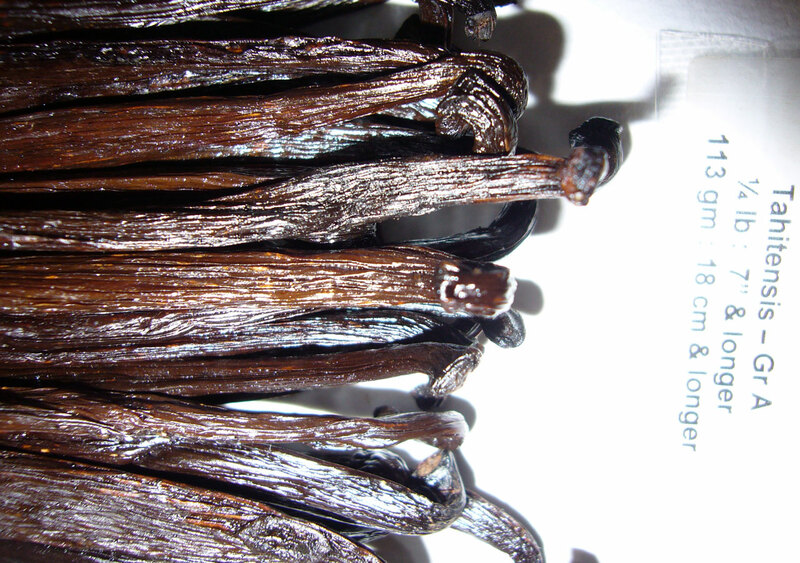 The Organic Vanilla Bean Company sells planifolia and tahitensis vanilla beans, grown organically in Papua New Guinea. 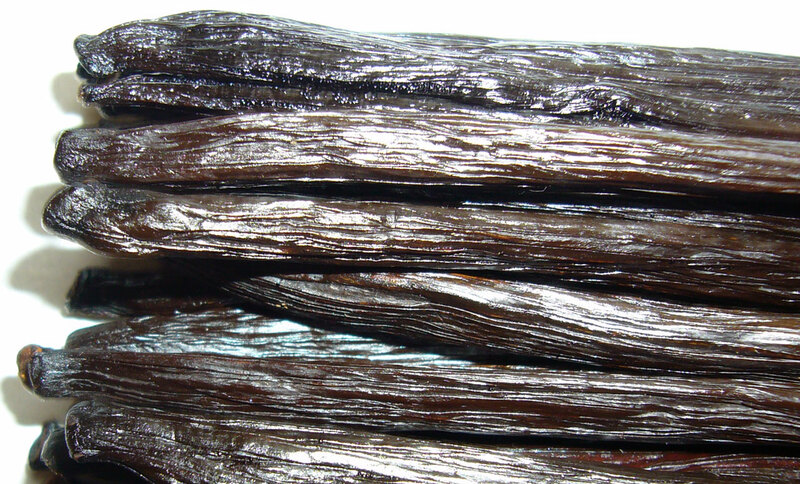 This is the biggest vanilla seller on eBay.com, but you can get free shipping on orders over $20 through their website. Check out their info on organic certification. The OVBC prides itself on a certified organic product that is grown using sustainable practices. 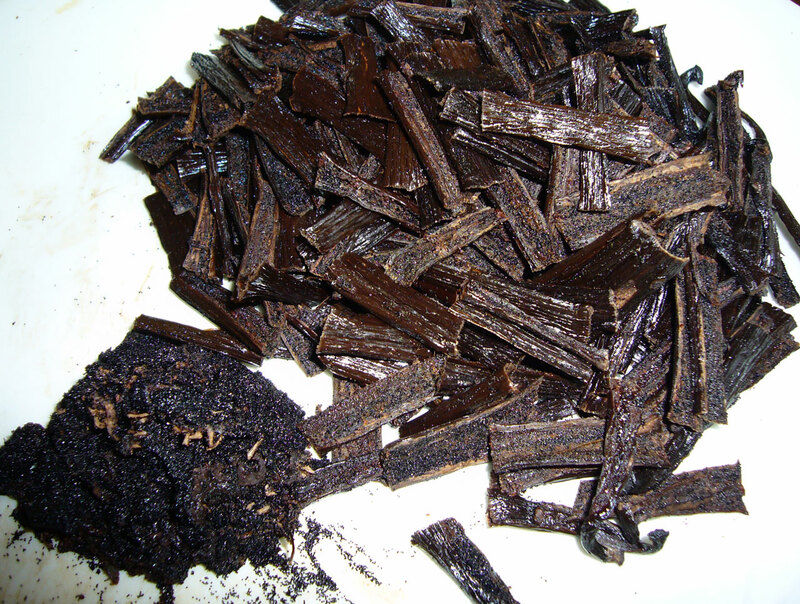 Jack of OVBC suggests a 70%/30% mix (either way) of planifolia and tahitensis vanilla beans for a great extract. The sample beans arrived super fast. Huge, plump beans with a “rustic” feel. All the beans, even the Tahitensis, were extremely pungent and chocolaty. 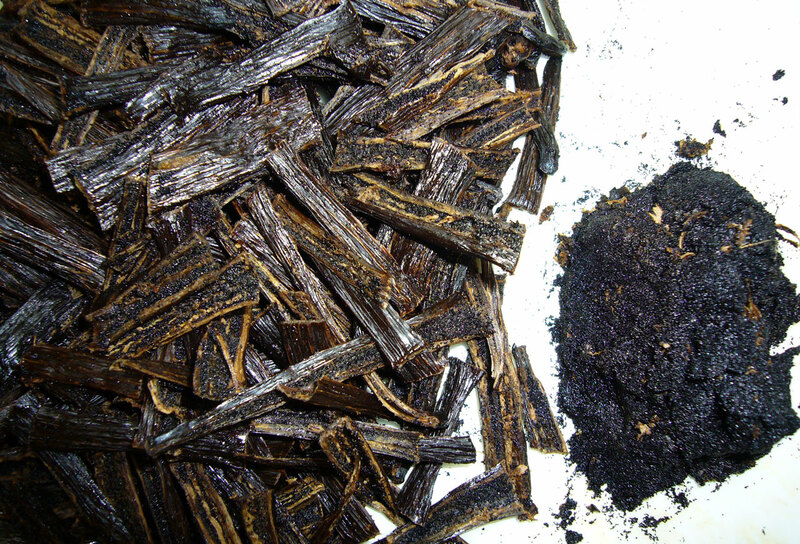 This is the result of variations in technique, landscape, and weather best described as terroir. 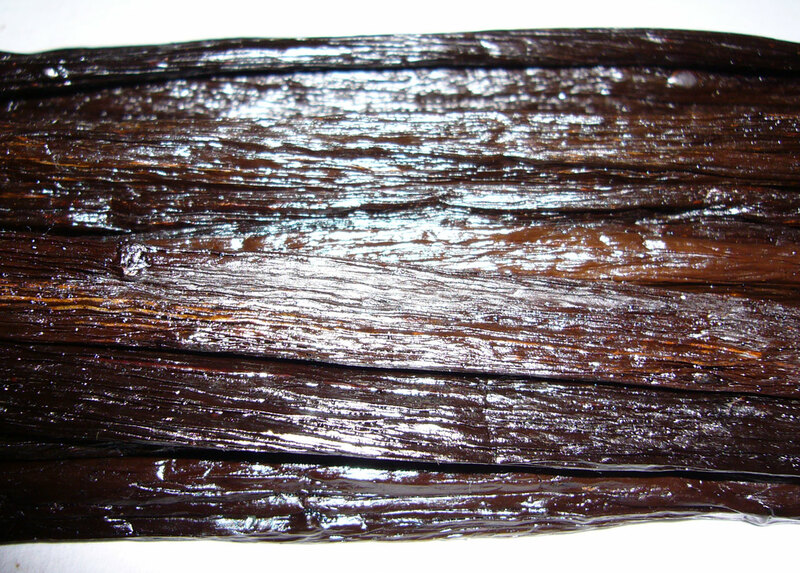 OVBC sells these huge PNG vanilla beans at a great price. 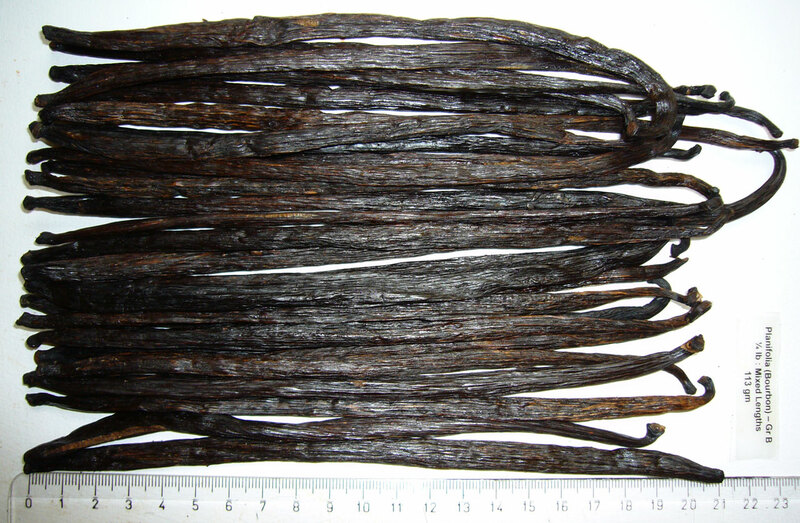 Very round and plump vanilla beans… and HUGE! 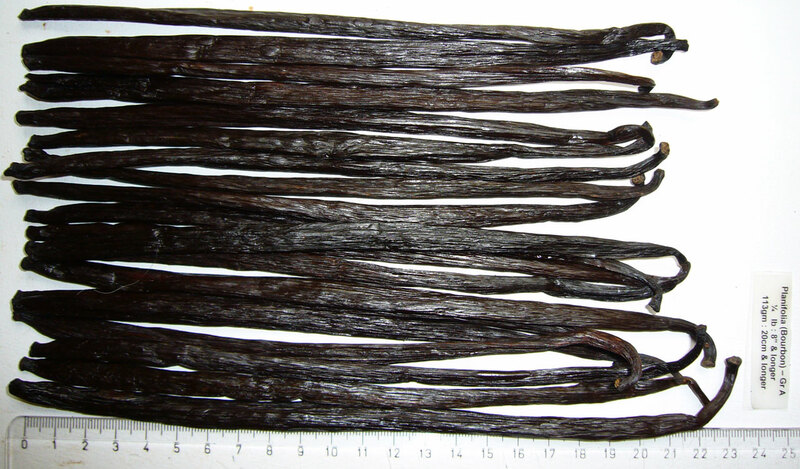 The longest beans in this review (February 2008, check the latest Longest Bean Awards…). These are advertised as the ‘plumpest bean on e-bay’ — they are certainly longer and fatter than the other e-Bay beans I reviewed. They are beautifully shaped. The firm skin has more of a matte finish than many beans, bit is very moist and flexible. Very high caviar yield — typical for very long beans. 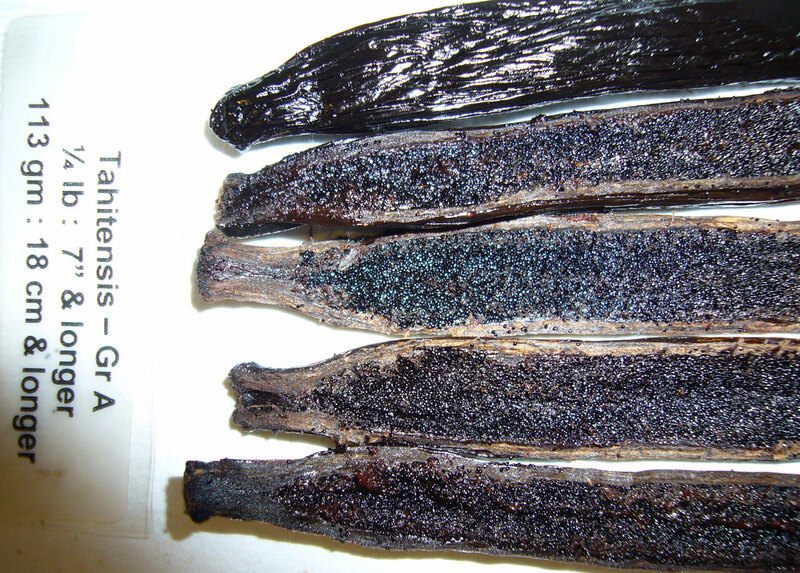 The caviar is moist and oily, it clumps well and is easy to shape. 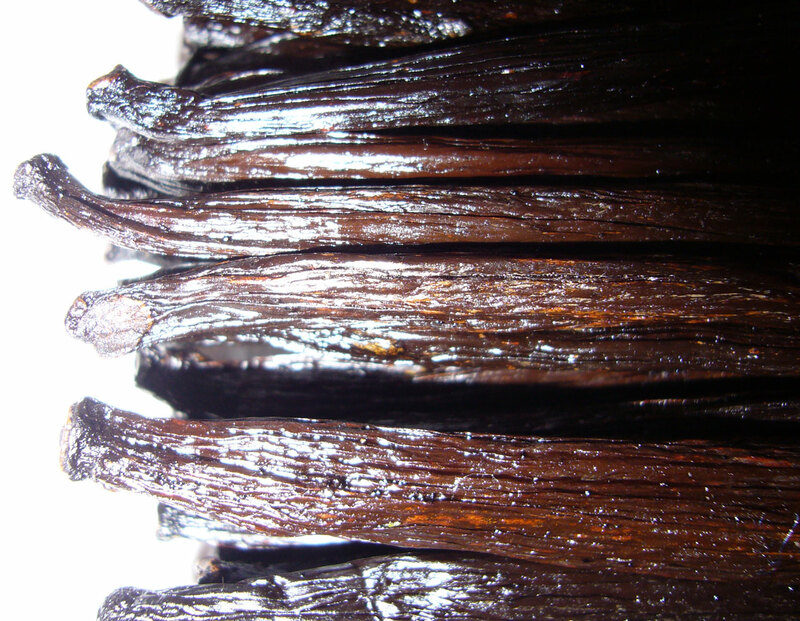 The aroma is extremely pungent, with dark, creamy, chocolate hints. These are the first extract beans I reviewed. I’m surprised how nice these beans are. A bit drier, woodier, and uglier than the Grade A beans, but still plenty soft and flexible. 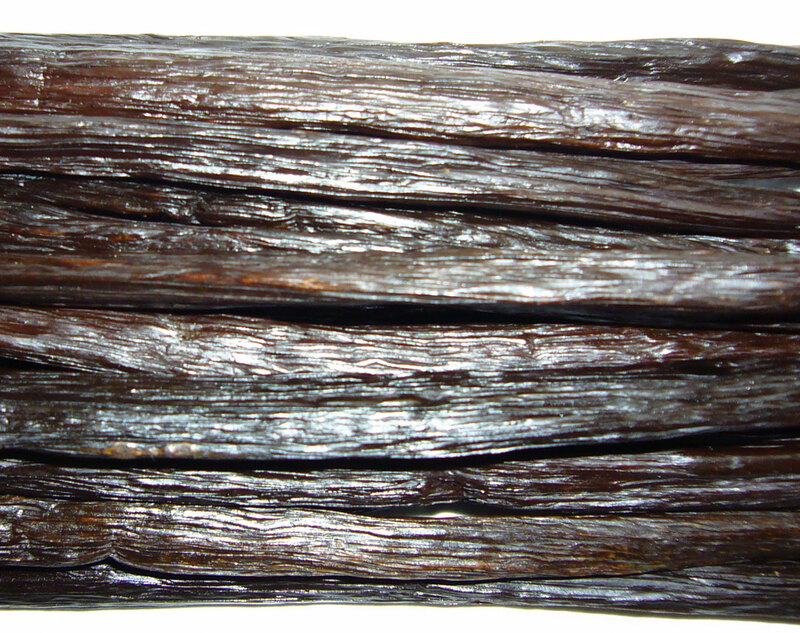 There are a variety of lengths, but all the beans are very long, wide, and plump. These beans have tons of caviar, but it’s slightly drier than the caviar from the grade A beans. Check out the close-up shots to see the difference in moisture content — but the caviar looks the same! 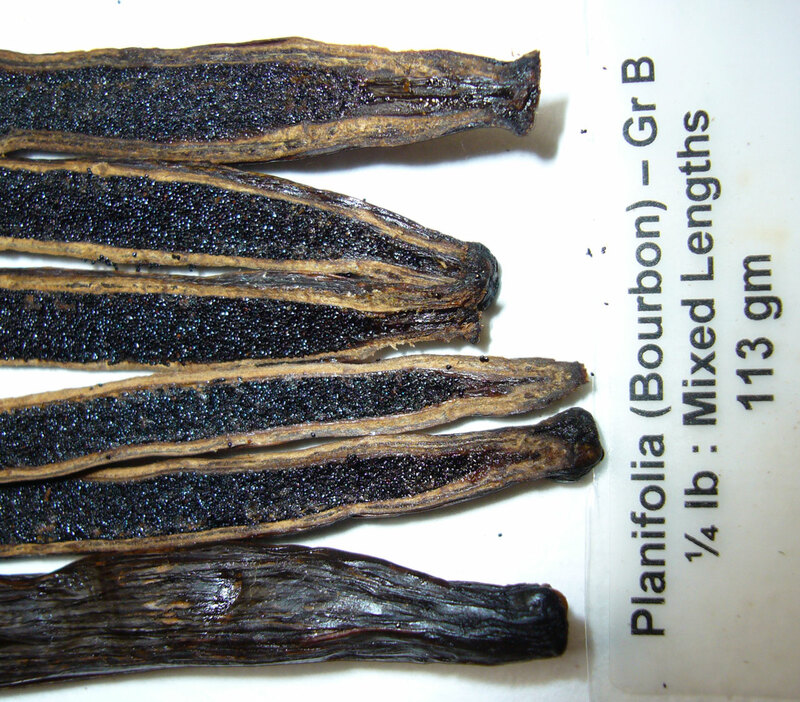 Great extract beans, perfect for making a big bottle of PNG vanilla extract. 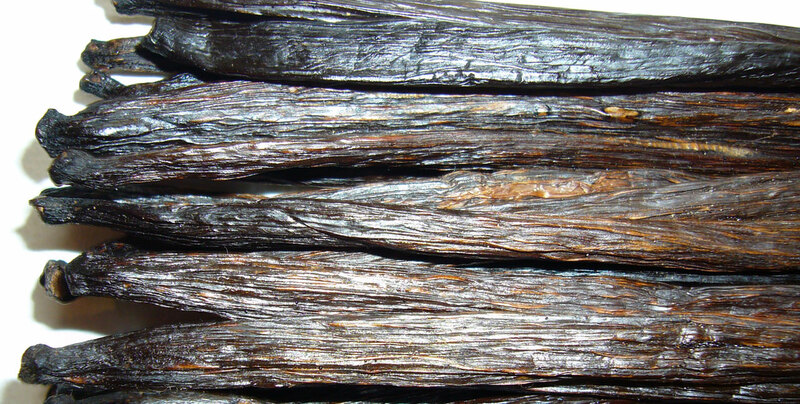 Woody extract beans can be harder to cut than a gourmet bean. Make sure you use a stable work surface. 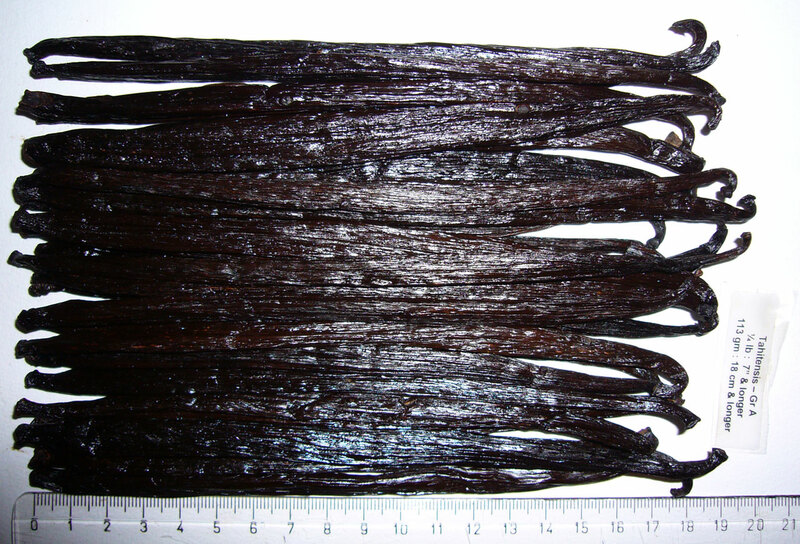 Long, plump, attractive Tahitensis beans — probably the longest Tahitensis beans in this review. 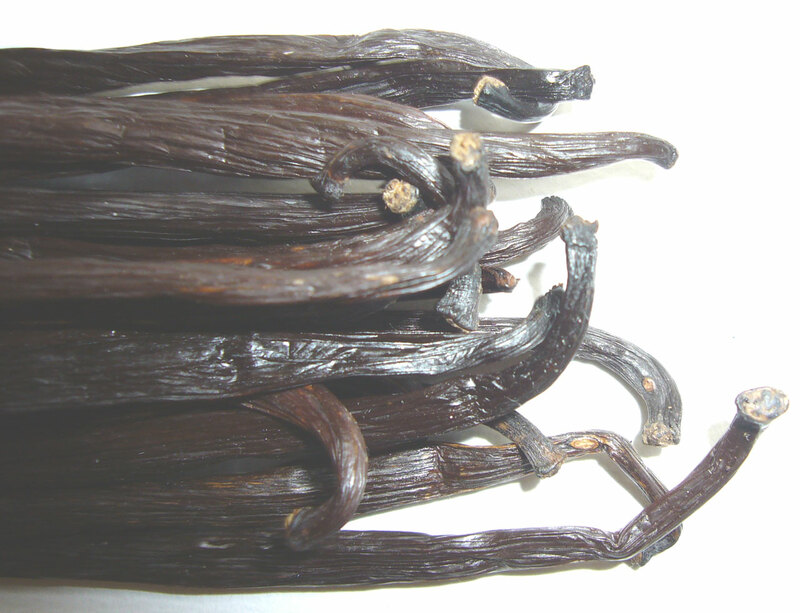 The beans are flexible and have oily skins. A moderately high yield of moist caviar. The texture of the caviar is crumbly. These beans have a very pungent Tahitensis aroma. One thing different about these beans is the color of the oil that leaked during preparation. Whereas most beans have a yellow-brown oil, these had an oil that was more of a green-gray. I don’t claim to know what this means, but I find it interesting. Grade B Tahitensis beans are available. 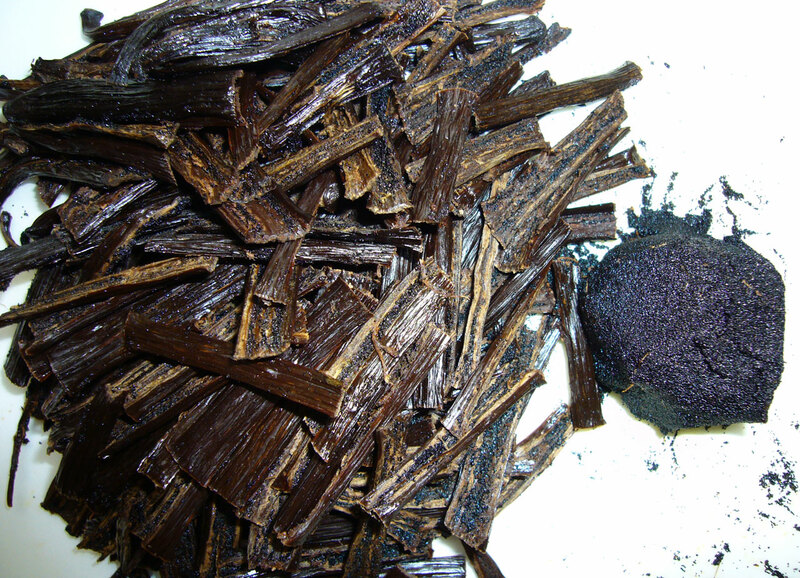 Write for info (info@organic-vanilla.com) on the Tahitensis extract beans, they sell out pretty fast. I’ll try to review them when the next crop is available. I have ordered from this company. They have great service and their beans were just lovely. My extract is brewing now.